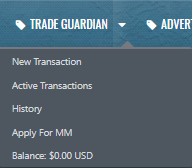 Middleman only works on Trade Guardian. All Middleman outside of Epicnpc Trade Guardian with Email/Discord/Facebook is a scam. I will be available almost all the time 18 hours/day from 9 pm - 3 pm EST, 6 pm - 1 pm PST. With over 2500+ Positive Feedback without a single Negative. You can complete trust in me and I will bring the best gaming experience to you. I also a Moderator so if you need help. Simply message me through Epicnpc Message.